Asanowaka Retires: The Showman's Final Bow! There are wrestlers who haven't revolutionised sumo but still remain in the collective memory, leaving a mark on their time. Even his fiercest detractors admit that Asanowaka, man of oversized cheekbones, belongs to this small and select club. If one had to define his style, one would find it troublesome. If one had to evaluate the quality of his sumo, the finesse of his bout strategies, it would certainly leave one baffled. He never knew the honour of being in sanyaku, and yet, what a rikishi he was! The paradox of Asanowaka is that he is remembered not for his bouts, but rather for his aggressive, even vicious approach to his matches. With his small and stocky stature (175 cm and 150 kg) he was capable of anything - the nastiest moves to bring him a victory, and the dirtiest tricks to avoid a loss and humiliation. The audience won't easily forget Asanowaka's clowning during the preparations for a match, when he would go so far as imitating a hopping toad, or even dancing in his corner before throwing the salt. In short a customer, the real deal, and deserving of a stirring homage! Let us review his career. Asanowaka is the first to admit that. 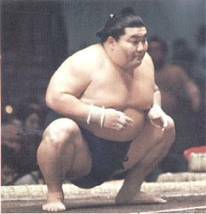 He learned sumo when he was very small and never stopped practising it. But he never won any titles, neither in children's sumo nor in high-school, and not even at the university level where he defended the colours of Kinki university. Still, his trainers taught him the basics well, and he had wonderfully powerful legs. In 1992 he had the felicitous idea to join the Wakamatsu stable before the reform of makushita tsukedashi status, which allowed him to enter directly at the bottom of makushita. From there he made a series of five kachi-koshi, including a makushita yusho. It is at this time that he established his shifty behaviour on the dohyo, profiting from his rare talent, namely exceptional reflexes. Anything goes...pull again and again! He did so many henka (side-steps at the tachi-ai) that he drew the thundering criticism of a number of oyakata on himself. But that is a small matter, and he hacked his way to the makuuchi division, where the things got gravely complicated. Besides his reflexes, Asanowaka possesses an oh-so-precious quality in the professional sumo. As a result of relentless practice, where notably I witnessed him perform an impressive series of shiko with weights on his ankles, the dancing toad has built a rock-solid body. He is one of the rare rikishi who never had any injuries and never missed one of his bouts, from his entry into professional sumo to his retirement. This makes a series of 1145 bouts in a row, 1110 of them among the sekitori. This last number assures his place in sumo history, as it is the ninth longest number of consecutive bouts among the sekitori. He truly has something to be proud of. Cheers and a long career to Wakamatsu (now Takasago) oyakata!